To help you through the planning process, I include a sample task list and project plan for this sample pet services site. Even if you’re feeling pressured to get a Web site online fast, you’ll save time in the long run if you take a little time to develop a plan first. The World Wide Web isn’t going anywhere. Even if you have to get your site online as quickly as possible, your goal should be to design a site that truly serves your audience, business, and goals — and that takes planning. Whether you’re planning to do all the work yourself, or you prefer to hire us to do it for you, the questions and planning tools in this article will help you get off to a good start. The first set of questions below are designed to help you consider the big picture. Take a few minutes to define the main goals of your site and you’ll be well on your way to answering most of the rest of questions that come up as you build a site. The content and task lists that follow will help you with one of the hardest parts of most Web design projects — one that many people underestimate — gathering all of the the text, images, bios, mugshots, product descriptions, illustrations, and whatever else you want to put on your site. You can hire other people to help you build a site, but at some point you have to gather all of the pieces and figure out how you want the puzzle to look when it’s done. Planning ahead can help. 1. Define your goals and objectives. 2. Create a content list. 3. Create a task list. 7. Create a site design. 8. Get the word out with a marketing plan. 9. Ongoing updates and development. A good project plan should include a timeline, a series of tasks, a list of the resources and materials you’ll need to complete the tasks, and a budget. The following provides a step-by-step approach to creating a web project plan, including questionnaires and other guides to help you. As you read down the page, you’ll find more details about every step except step 7. (Creating a site design is a big step — and you can learn more about designing web sites and blogs in this article). Before you even start, make sure that you (and your staff, friends, or family) are clear about why you’re creating a Web site. Why do you want a site and what are you goals? Promote Pamela’s dog walking, grooming, and other services. Showcase Pamela’s pet service experience and credentials. Help customers find Pamela’s contact information and hours. Develop a mailing list by encouraging site visitors to register for Pamela’s special services and newsletter. Why is having a Web site important to you? Will you use your Web site to promote your business? Or do you want to sell products, cut costs, showcase your portfolio, provide customer support, stay in touch with family, or do something that no one else has ever done on the web? Write down your top goals and refine them until you have two (at most, three) clear objectives for your site. Then keep your list of goals on your computer monitor, office door, or bathroom mirror. Whenever you have a question about any aspect of your web site, go back to your top three goals and make sure that your decisions keep you focused on what’s most important to you. What to you know about the people who will visit your Web site? Consider your audience above all else. If you’re creating a sales site for real estate investors, get serious, or silly, but do it in a different way than you would if you were creating a game site for 12-year-olds. If you’re not sure what 12-year-olds want on a Web site, round some up and ask them. The better you know your audience, the better you can launch your site with content they will find useful. After you get the first draft online, you can start tracking visitors through your web site and further tailor it to their needs. Serving your target audience should be a key factor in any decisions you make about your site, from the vocabulary you use to how publicly you promote it, to what information you offer. For example, a site for doctors might include complex medical terms, a site for patients needs more common language. Similarly, an architect might create a Web site with a public section where potential clients can view completed projects and testimonials, and also create a password-protected section where clients can view plans privately. What do you want users to do on your Web site? The more specific you can be about what you want visitors to do on your site, the better. Do you want people to buy lots of products, or one high-ticket item. Do you to perform a specialized, personal service to a few clients, or do you serve a large audience? Do you want to make it easier for people to join or participate in your association, call for an appointment, sign up for a newsletter, or just tell their friends and family how cool you are? You want your site’s design to encourage visitors to take that action and to make it as easy as possible. How can you make it easier for your audience? Some people call it ‘frictionless.’ You don’t want anything to come between your visitors and the action you want them to take. Information needs to be easy to find — and search and scan. Shopping carts need to be intuitive to fill — and evern easier to use when you wan customers to checkout. Your goal is to create a suite that guides your audience through your site without them getting lost, bored, or insulting their intelligence. Research what other people have done with web sites on similar or related topics before you get too far into developing your own plans. Consider what’s realistic compared to the experience of others, and how to distinguish yourself to attract an audience, especially if you’re starting a web site in a competitive category . An afternoon spent surfing the web for related businesses, and even unrelated businesses that have similar features, can help you identify things you may want to include on your own site. Do you expect to make money on your Web site? If your answer is, “Of course I do!” that goal should shape everything you do as you design the way visitors will use your site. But remember, web sites are more than just potential cash generators, Web sites can help you be more competitive, advertise your store or services, schedule and inform staff. Some of the most successful Web sites are designed to save money by reducing expenses. All the text, graphics, and multimedia that you want to display on the pages of your Web site are commonly referred to as thecontent of your site. To help guide your work and planning, your content list should be as specific as possible. The best way to start creating a content list is to brainstorm all the things you might want to include, such as contact information, product descriptions, logos, staff pictures and biographies. A detailed content list will serve as a valuable tool as you develop your project plan, site map, and task list. As you continue to develop the site, you’ll probably discover more things that you want to add to the content list, so make sure to create it in a way that’s easy to add to and edit as you progress. Tip: A program like Microsoft Word (or, if you prefer, Excel) is an excellent tool for creating a task list because you can easily make edits, copy sections in and out of email messages, and move content around. The following includes many common tasks you’ll likely want to include in your own list. Register domain name for the Web site and get a ‘holder page’ online. Evaluate and select a Web site hosting company. Create a list of all the main sections and subsections of the site. Create and gather photos and graphics. Request photos or graphics from other people (graphic designers, clients, and friends). Create a site map that details how the main sections and subsections will be organized and linked. Optimize images, graphics, and multimedia files to prepare them for the site. 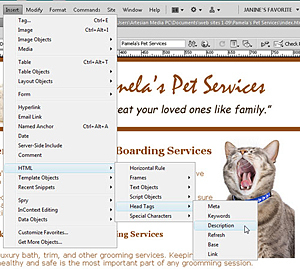 Find or develope templates to create the home page, each main section front, and any special internal pages. Build out the pages of the site, adding content into the page templates. Publish your site on the Web. Tell everyone you know that your site is online and keep working on your marketing plan. The task list — the heart of your project plan — is a list of tasks that must be accomplished before you can launch your Web site (or at least the first version or redesign). Your task list should include everything from registering your domain name to promoting your site after it’s launched. You can create a task list in many ways, including a few software programs designed to help with project management. If you’re creating a relatively simple Web site, you may just need a few notes with dates attached to each task. If you’re working on a more complex project with a team, you need to define a detailed task list. When you create your task list, keep in mind that gathering your content is time-consuming. Most people underestimate how much time they’ll spend taking pictures (or finding the ones they already have); gathering digital versions of logos and other graphics; and writing all the text descriptions, biographies and other elements for their Web site. Creating a comprehensive content list at the beginning can serve as a great first step and an excellent guide to help you gauge how long it will take you to gather, create, and review all the contents of your site. If you hired a graphic designer to create your logo or brochure, you may want to go back to that person to ask for digital copies of the text and graphics, but don’t expect to get it overnight. Plan ahead and request any materials you may need from other people early in the process so you’ll be less likely to have to delay launching your site because you’re still waiting for them. After you get clear on your goals and the tasks you need to complete before you launch your website, it’s time to create a timeline and set deadlines. Be sure to give yourself a realistic timeframe to do a good job, and factor in a little more time than you think you need, especially if you’re new to web design. Even if you’re working on a web site by yourself, or with a very small team, setting deadlines is one of the most important parts of any project plan – and gives you a much better chance of finishing. Try tying a deadline to a special event or occasion. For example, set a launch date for a family web site on your grandma’s birthday and make it a surprise for her. Or, plan to publish the redesign for your small business site in time for a trade show or annual sales event. When a deadline has a clear goal associated with it, it’s easier to take seriously. Most good web sites are never-ending projects because you can always add more content and features. Don’t let that temptation to keep adding new features prevent you from ever getting your site launched. A great way to keep your website schedule realistic is to ruthlessly review your task list and break the project into two or three phases. Phase 1, should include only the most important features you want on your site, the things you have to have to meet your top goals. Set a deadline for the first phase of development, and then hold yourself to getting only that much done and launched before you add more to your ‘to do’ list. If you don’t already have a site online at all, my first recommendation is that you set up hosting and a simple page at your domain name as soon as you can. You can then build or redesign your site in private, but register a domain name and get your web hosting ready so you don’t face unecessary delays when you’re ready to publish. “How much does a Web site cost?” is often the first question asked by someone who decides that they want a Web site. But, if you think about it, it’s a little like asking how much it costs to build a house, the answer depends on how many rooms you want and whether you want a swimming pool in the backyard. Fortunately, most Web sites (at least the kind you’re likely to build yourself with the templates and instructions provided on this site) don’t cost nearly as much as a house ( even a dog house). Before you can set a realistic budget, though, you need to break down the project into pieces by creating a task list. The final step for the budget is to add prices to each task on your list (the final steps is reviewing your priorities). Web hosting: This service can cost as little as a few dollars per month or hundred dollars (if you get a lot of traffic to your web site or need special services, such as video hosting or ecommerce). You find suggestions for choosing the best hosting service here. Software programs for graphics: The tools used to create a Web site can range from free to expensive. At the very least, consider getting an image editing program. You can buy a professional tool (Adobe Photoshop is the most popular, but it’s not cheap) or you can get a more ‘consumer-priced’ option, such as Photoshop Elements (for less than $100). If you’re a dedicated web designer, you may prefer Fireworks. Learn more about the best graphics programs for web design in this article. Software programs for Web design: I love Adobe Dreamweaver and it’s easy to understand why it’s the most popular web design program on the market. However, Microsoft Expression Web is also a great program, especially if you prefer Microsoft products. If you’re wondering about FrontPage or GoLive and how all of these programs compare, check out this article: What’s the best web design program? Your time: If you’re building a site yourself, one of your biggest costs is likely to be the time you spend working on it. Don’t underestimate the value of your own time if you run your own business. It may be well worth hiring a student or an assistant to help with time-consuming tasks, such as adding text and images to all the pages of your site, or scanning lots of photos and graphics. Shopping cart and e-commerce: If you want a shopping system, compare the costs of a few and then include a rough estimate until you make a final decision. You’ll find a review of shopping cart services here. Traffic Reporting Services: Most web hosting companies provide basic traffic statistics about visitors to your web site, but you will almost always get more detailed reports if you use a dedicated traffic tracking services, such as Google Analytics. As you put together your budget, start with the clear-cut costs, like paying for a domain name and hosting, and then move on to other items specific to your needs and include your best estimate. After you have a price quote for each element and begin putting the pieces together, you can distinguish the more expensive features and better decide which ones you can afford now and which ones you may want to add later. Don’t go it alone! The best Web sites are developed by a team of people with a variety of skills, including writers, designers, programmers, and multimedia producers. If you’re developing a relatively small, simple Web site, you might not need a lot of people with specialized skills on your team, but the more you can divide the work among experts, the better. Throughout this web site, I’ve worked hard to give you the best and easiest ways to create a Web site on your own, but I would be remiss not to point out that hiring a specialist or two once in a while can be a helpful way to complement the work you do yourself. Don’t be afraid to ask for help if you need it.